Ooh Slice of Cherry looks so good. Hope you enjoy reading all your books. New follower, Love the blog! Cute! Good books this week! Have a great week! LOVE Holly Black! The Poison Eaters is a great collection. SLICE + LO DOWN look really good, enjoy! Looks like you got lots of good books this week! Happy reading! Awesome books! I have heard about the book The education of Hailey Kendrick, sounds awesome. I do hope you read it and review it. Oh My Goodness! Great list this week. Happy reading !! I'm a new follower by the way !! The Cryers Cross sounds like it'll be a good one. I've read quite a few reviews on it this last couple of weeks. I'm a new follower! Love this blog. I have no idea how I've missed it! New Follower, where have you been?! And don’t forget to enter my book-a-week giveaway! I met Devon a couple weeks ago, she's awesome! I have Cryer's Cross on it's way to me. I loved the Wake series so I'm looking forward to read this one and seeing how different it is. You got some amazing books though! Yeay! I love IMM. My to-reads list is growing by leaps and bounds today!!! Hope you will stop by mine! Hi i'm a new follower :). 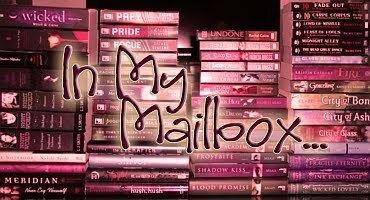 I've just discovered your blog and I love the design :D.
You've received great books by the way.